Lay chicken breasts between sheets of plastic wrap and pound to 1/2-inch thickness. On a medium plate, mix flour with 1/4 teaspoon salt and pepper; dredge chicken to coat, patting off any excess. In medium, nonstick fry pan over medium heat, warm 1 teaspoon butter and oil. Saute chicken breasts on both sides until browned and firm, about 3 minutes per side. Remove chicken; keep warm until ready to serve. Add onion to skillet and saute until softened, about 4 minutes. Increase heat to high, add tomato and saute until most of the moisture has evaporated. Lower heat to low and add crab meat; toss gently, just until hot. In small saucepan over low heat, melt 1 tablespoon butter with lemon juice to make sauce. Whisk in cream cheese, milk and chives until smooth. Oh, now this just may be our Valentine's Dinner! This looks and sounds SO good! Thanks for sharing at the #HomeMattersParty :) Hope to see you again next week. What a beautiful looking dish. Your Chicken Oscar looks and sounds mouthwatering. Thank you for sharing with the Clever Chicks Blog Hop! I hope you’ll join us again next week! What a great chicken recipe. 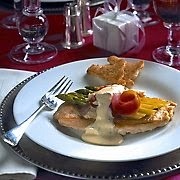 I love finding new recipes for chicken - it is our favorite protein. Thanks for linking to the This is How We Roll Link Party. See you on Thursday!